There are times when a record label can bring a lot of misconceptions in music. A fine example is: what is Doom Metal? To some fans, you can think of a bitter and slow paced form of heavy music, in the same vein of names as WITCHFINDER GENERAL and TROUBLE, or can use an elegant voice keeping the bitter sonority (as CANDLEMASS during Messiah Marcolin ages), or even can use grunts or a Gothic aesthetics. Doom Metal demands a further explanation to be understood due the ample range of musical possibilities held by the genre itself. 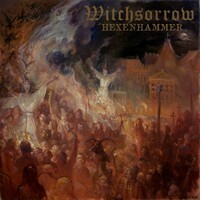 So, what is the English trio WITCHSORROW all about with their fourth album, “Haxenhammer?” It’s a simple answer: to blow your ears! If I can use fez words to describe their musical work, it’s a classic Doom Metal band, like ancients as PENTAGRAM and SAINT VITUS: slow tempos, with that energy filled with bitterness and done with harsh melodies. Obviously, their music does not sound as something original, but it’s truly good, filled with personality, and it’s really charming, weaving a melodic spell on us all. On a Doom Metal album with this more classic and old insight, some can think that the sound quality of “Haxenhammer” can be filthy and raw. We can say that they have a very good set of distorted instrumental tunes, what can give you the idea that it’s organic and crude sound, but it’s clear. It seems that they used the studio equipments to build a sound quality as simple as possible, but keeping it clear. Yes, you’ll hear and understand what they play as well.